An amazing thing is about to happen – Barack Obama’s inauguration. But a (much smaller) amazing thing just happened to me and perhaps to millions of other Facebook/CNN users. 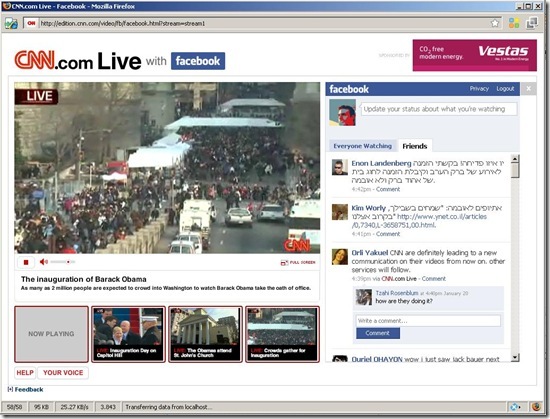 I logged into CNN to watch some live coverage of the Obama inauration….and without doing anything, was logged in automatically to the CNN/Facebook joint inauguration experience. I don’t remember giving CNN my Facebook login (although I am sure i did at some point), but it doesn’t really matter. As soon as I clicked on the live inauguration coverage, there they all were: my Facebook friends. I immediately saw comments from Ouriel Ohayon, Orli Yakuel, and others. And I realized that I was experiencing something new about the social web. This is “social network serendipity:” One website (CNN) leveraging my social graph in unexpected ways to bring a user (me) content that is very valuable to me (my friends’ comments on a live event) via a social graph provided by another website (Facebook). It was unexpected and welcome – and that’s serendipity. This illustrates what people mean when they say that Facebook is the operating system of the social web. Its the promise of Facebook Connect, and its very very real. There’s opportunity for start-ups such as Loomia to create some value here, but I think this one might pretty much be a done deal. Social networks benefit from huge economies of scale and they also benefit from making it really easy for others to leverage their social graphs, so opportunities for start-ups might be more limited than we’d like to think. Posted by gdibner on Tuesday, January 20, 2009, at 9:51 am. Filed under Internet, Software, Technology, Video. Tagged CNN, Facebook, Facebook Connect, Obama, Social Networking, Video. Follow any responses to this post with its comments RSS feed. Both comments and trackbacks are currently closed.